researchers working in mathematical sciences to keep liaison not only with the researchers working in their area but also to keep themselves abreast of the latest fields of research in mathematical sciences. The present book aims to fulfil this need of researchers. 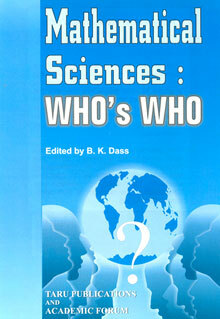 This volume contains some 505 entries and records in a unique form the biographical information of mathematical scientists from as many as 52 countries alongwith their fields of interest and specialization, the quantum of work done, their affiliations etc.